Neither of these is me, Image source. 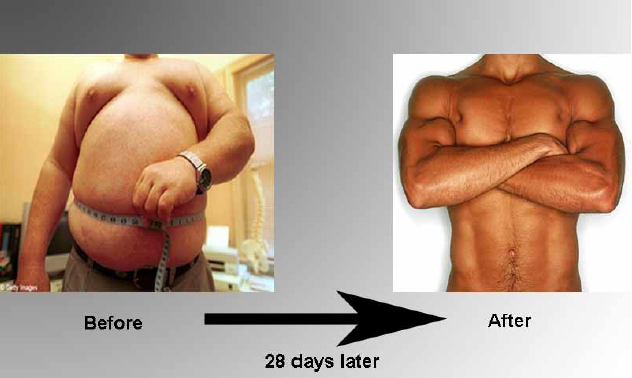 Here is the harsh reality – any man or woman who has lost more than 100 pounds to reach their ‘goal weight’ will NEVER look the same as someone who has maintained that goal weight for their entire lives. Well, perhaps with surgery, skin removal and liposuction they can get pretty close. Nor will they look the same as they thought when they started the weight loss process. The “Changing Room” photos place Kozerski in the conventional story our culture tells about weight loss: the no-brainer cause and effect of “Look Great, Feel Good!,” as cheerfully suggested by People magazine’s weight-loss cover stories and The Biggest Loser’s original theme song. The “Half” photos, by contrast, explore Kozerski’s surprise at eventually finding that happily-ever-after image lacking. As I noted in my first ‘Running Story’, I lost more than 175 pounds during 1989 and into early 1990. When people I knew saw me, they were stunned at the differences, and I got loads of compliments … and also comments and observations. Things about the proportions of my body – my head, neck and so on. I know part of it was them seeing me differently, but part of it was physical – my body needed time to adapt. And your body does adapt for the most part – I haven’t gotten a comment about my head looking out of proportion with my body in 23 years. But there ARE ways the body never adapts. Your skin never seems to truly forget. I have stretch marks and loose skin – nothing compared to the woman from the article, but enough that I know my body will never really look the way I would like. If I had a dollar for every time Lisa has told me ‘it is just loose skin’, the kids’ college funds would be over-flowing with cash. I like to joke with myself that at best I have a 4-pack! If you look at my ‘about’ picture you see me as I am – thin and fairly well defined. Yet when I come back from a run, I can see my ab definition mixed with a ‘dunlop’ (your belly done-lopped over your belt)! Again it isn’t a huge problem – that orange shirt is fitted and not hiding much! It is a reminder that actually applies to everything – we get a mental picture in our heads: if I do this, that will happen. Whether it is money, a job, a romantic interest, a house, car or whatever … even as adults we attach unrealistic expectations to these things, and buy into the images pushed by people who make money off of us grasping at those dreams. If you wonder why so many people fail at weight loss even after a huge success … this ‘post loss depression’ feeling certainly plays into it. I had taken a couple of other pictures that I guess I’m not really ready to share, but I found a perfect one from the Wineglass Marathon. At this point I weigh 200 pounds less than when I graduated RPI and 100 pounds less than when I turned 46 in April 2012. 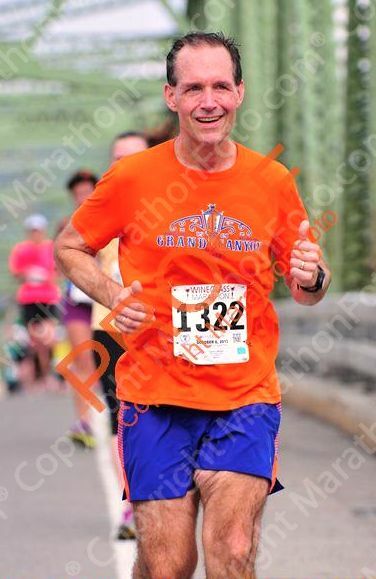 Here I am going across the bridge towards Market Street and the finish, and if you look at my inner thigh you can see the significant amount of loose skin I am dealing with. Running and eating healthy are two big things in my life right now, and for nearly 25 years I have done my best to keep my weight under control. I know that my body will never look like that mental image I had way back when I started – but that is OK. I am very healthy now, and in the best shape of my life. I have a great many things to be thankful for in my life with a great marriage and wonderful kids … so if I have to deal with loose skin and stretch marks, that is something I can handle. This entry was posted in Healthy Eating, Weight Loss by txa1265. Bookmark the permalink. I struggle with this also. I have stretch marks that I struggle with. Not many compared to a lot of women, but nonetheless I have them. I hate them…sometimes. There are times when I am like you know what, these were from my kids and whatever it takes, I will do it! Other times (like when trying swimsuits on), I get discouraged by them. A fitness model/competitor I follow on Facebook actually posted a picture the other day about stretch marks. She is one of “those” bodies that I have in my head as my goal when working out. But here I think, ahhh my body won’t look like that because of my stretch marks. Well, she has them too! You just can’t see them in her pictures (of course) because of the make-up, editing, etc. Will I ever have “that” body? Probably not. My skin had been stretched too much for too long, but you are right, I am healthy now and have a great family that loves me marks and all! I had my two oldest son’s in my early twenties and bounced back pretty quick with very few stretchmarks but when I had my youngest son I was in my late thirties. He’s 6 now and my belly area just didn’t bounce back like it did before. Thirteen years made a difference and although I will never have that taut belly again he was worth every bit of it. Thanks for sharing this! While I’ve never lost more than 15 pounds and don’t have stretch marks, I relate to it because there are always parts of our bodies that we don’t love, but have to force ourselves to appreciate anyway. You’ve come SO far, and you look amazing!! I truly never would have noticed the skin on your thighs unless I was specifically looking for it because you pointed it out! Be proud :). Thanks Megan – I have to admit having an issue for a while when I first lost weight with people who would only have a few pounds to lose. It took me a while to realize that our struggles with our weight and appearance and our body image issues are our own … and like you say they are something we all have to deal with. I completely understand and think that’s justified! Yes, everyone has body struggles, but undergoing such a massive weight loss is something that I will never be able to relate to on a completely personal level. I CAN admire it, though! I don’t let myself off so easily, Megan – one thing with obese people is not liking the feeling of being judged in all things because of weight. For example, the thought is when someone is obese, they are also lazy, weak, not a hard worker,slow, unwilling to do what it takes to succeed, impulsive, and so on. So for me as someone who was obese and had those feelings (you really CAN feel the eyes of judgment on you), to then as a thin person turn around and judge others … shameful. That said, I very much did see a distinct difference in how people treated me. And since I have always been very good remembering faces, I could go to a social situation and see the same person who was very dismissive before suddenly be very engaging.